Barry goes on to say that “Rework simply should not happen in a digital workplace.” We at SlideSource.com completely agree. In the Coveo survey, when asked if they were able to quickly find and reuse work that had been created before, almost 40% said they were only able to do this less than 25% of the time. That means 75% of the time they are re-working, re-creating and being far less productive than they could and should be. The Coveo survey also found that knowledge workers believed their organizations would benefit from better performance in innovation, higher sales and profitability if they had better access to existing content. In other recent research, PowerPoint was found to be part of the “machinery of knowledge production.” SlideSource.com is committed to helping companies achieve better results through improved management of and collaboration around their presentation content. In other words, every slide should count. 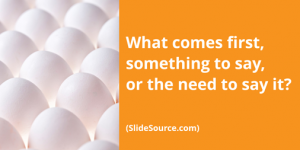 Translating this idea into the rhetoric of business presentations, one might ask “what comes first, something to say, or the need to say it?” In other words, do people have presentations milling around in their brains just waiting for an opportunity to be delivered to an unsuspecting audience? Or, and I think this is more generally true, do people find themselves needing to deliver a talk, which then requires them to figure out something to say and how to say it. This is the process of preparing a presentation — turning wispy thoughts and vague notions into content that will communicate a specific message to a particular audience. Certainly some presenters (those who get $50K+ per event, for example) have a prepared speech that they want to deliver to as many audiences as they possibly can. But most of the presenters I work with find out they have to give a presentation (they have a need to say something) and then go about figuring out exactly what they will say and how best to say it. The process of figuring out what to say can be pretty straightforward if you are the only person doing the figuring. If however, the presentation must be developed by a team of individuals with different expertise, different organizational roles and competing agendas (and egos), well, the process can be anything but straightforward. And guess what tool is used most often to mediate this most unwieldy process? That’s right. PowerPoint. As teams go about deciding what to say, many parts of the process actually seem to be measured in PowerPoint slides. Progress and time are measured in slides (we have talked for 2 hours and have only reviewed 3 slides! ), who wins and loses content disagreements is measured in slides (Jack, your slides are out! ), time is measured in slides (we only have 12 slides to go!) in fact, the ability to have a strategic discussion at all can be dependent on whether or not the current versions of slides are available for review and correctly formatted. 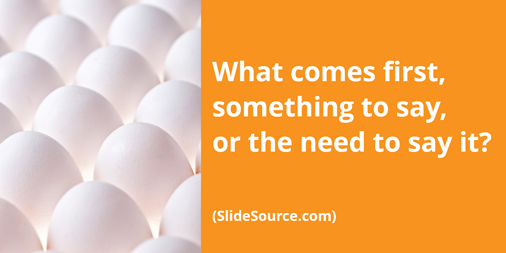 So, in the proverbial argument about which came first, chicken or egg, the answer may actually be PowerPoint.